Akoya pearls are truly classic pearls that are round in shape and are almost smooth. They have very few imperfections or no imperfections at all. 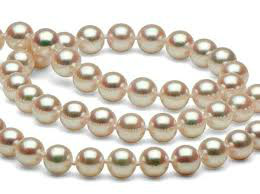 They have the highest lustre and shine when compared to other pearls. These pearls are white or cream in color. 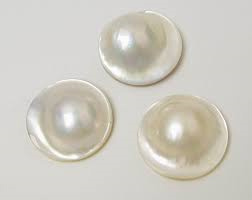 Akoya pearls are known for the perfectly round shapes, brilliant white body color, and metallic luster. Tahitian Pearls are grown in the Black-Lipped Oyster. These pearls are black in color and are large ranging from 9 mm–16 mm in size. The most exotic of all pearl types are the pearls grown on the volcanic atolls of French Polynesia. These Tahitian pearls are often referred to as black pearls, but in reality.Tahitian pearls grow in nearly every color, from white to jet black. Tahitian Pearls come in a wide range of colors such as black, grey, silver, green, blue and purple. They are the most rare from the pearl section as they take a very long time to grow in their natural state. Biwa pearls are small, unusually shaped cultured pearls from the freshwater mussels of Lake Biwa, Japan. First produced in the 1930s, their quality rivaled that of both natural and cultured saltwater pearls, and they were far less expensive to own. 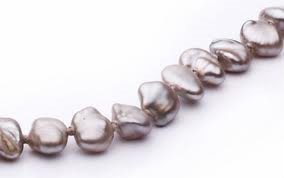 For many years any freshwater pearl was called a Biwa, regardless of its provenance. A cultured pearl is any pearl that was created with the assistance of a human. A pearl is cultured by opening a live mollusk slightly and inserting a small piece of mantle tissue or a small pearl into the mantle of the animal. This nucleation process of introducing a foreign object causes the mollusk to protect itself by covering the inserted material with a substance called nacre. Once “nucleated”, the animal is then attached to a wire frame and the frame is suspended from a float in the water from which the animal came either seawater in the case of salt water pearls or fresh water lakes in the case of fresh water pearls. A single mussel from fresh water can produce 10 or more pearls. Natural colors can range from white, lavender, peach, or pink. 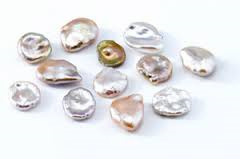 Coin pearls have a flat surface just like coins and are freshwater pearls. The flat surface of the pearl allows more light to reflect off the surface of the pearl. This results in the pearl having a greater shine when compared to other pearls. Mabe Pearls are flat-bottomed, half-spherical Pearls that have grown attached to the inner shell of a mollusk, rather than in the soft tissue, as is more common. Sometimes this can occur naturally. Some common mollusks that grow mabe pearls are the Pinctada Maxima, Pteria penguin and Pteria sterna. Cultured Mabe Pearls, also known as Blister Pearls when they are growing, have been grown by Pearl farmers on purpose since the 1970's, by attaching with glue a flat or hemispherical nucleus or disc to the inside of the shell. Besides using oysters, abalones are also used to produce Mabe Pearls. Mabe Pearls can take various forms, as rounds, drops, ovals or hearts. Specialty shapes can also be created. 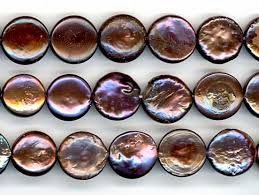 These discs are covered withnacre by the mollusk, over time, with layers building up and producing the characteristic pearly iridesence and sheen. This can take between eight months and six years, at which time a millimeter or more of nacre will have built up over the glued-on disc. Mabe Pearls can be as small as five millimeters and as large as 20 millimeters, depending on the size of their mollusk host and the introduced hemispherical disc. These Mabe Pearls are most often used in applications like earrings and rings, where their flat shape is beneficial. They have good luster and orient, and a variety of colorations and shapes, but they are less expensive than round pearls that can be strung. They can range from pinks to blues, and rainbow colors with swirls. Keshi Pearls are rare freshwater pearls and are fully made of nacre. These pearls are not round in shape. 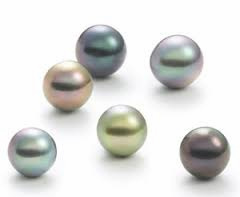 These pearls do not have the particle (also referred to as the nucleus of the pearl) that acts as an irritant. Keshi Pearls come in different shapes, sizes and colors. In the case of Keshi Pearls the particle (nucleus) that acts as an irritant is pushed out of the mollusk but the pearl formation continues. 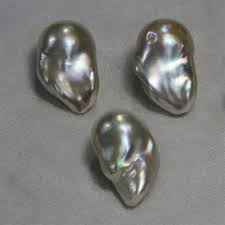 Due to the absence of a central nucleus the entire pearl is made of nacre.